Some shops are staying open later so you can shop straight through the dinner hour. Firstly, we just got an e-mail from one of our favorite Lower East Side shops, ultra-chic eco boutique Kaight, alerting us to what's sure to be a great night of shopping and overall midsummer night cheer: an Orchard Street block party. Ten spots on the block between Grand and Broome on the fashion-centric Orchard Street will be staying open late (until 10PM!) for the event, and offering up all kinds of special deals, drinks, eats, and more. On the clothing end, get 20 percent off gorgeous organic pieces at Kaight, or wander over to costume jewelry shop Wendy Mink for a 15 percent discount. Top it off with a trip to the Dressing Room (a co-op designer store meets bar) for a whopping 50 percent off cocktails. You know, to erase any shopper's remorse you may be feeling. Get all the details (including a complete lineup on participating store and more deals on local food) on Kaight's blog. 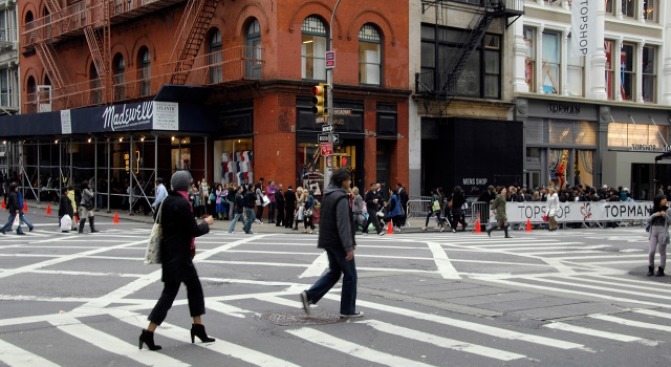 Secondly, more than a dozen stores in the Meatpacking District will be keeping their doors open until 9PM this summer to give shoppers time to enjoy the longer days and warm evenings by strolling past neighborhood shops like Helmut Lang, Ports 1961, Shelly Steffee, Theory, and more. Even better, some of the stores are offering to messenger your purchases for free the next day, so you don't have to lug all those shopping bags to dinner, drinks, or what-have-you. See the full list of participating stores here.